We're halfway through the year--that's crazy! I'm feeling great about where I'm at so far with this goal. It hasn't caused me to stretch very much, but I have been enjoying it! I think if I were to revise it for another year, I would need to add a qualifier about reading a certain type of biographies, or biographies from a certain time in history. 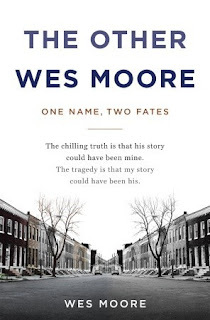 The Wes Moore who wrote the book is a Rhodes scholar, and a successful businessman. He was reading the newspaper one day when he came across an article about another Wes Moore--sentenced to life in prison for the murder of an ex-cop during an armed robbery. For some reason, this man's fate stayed with him. 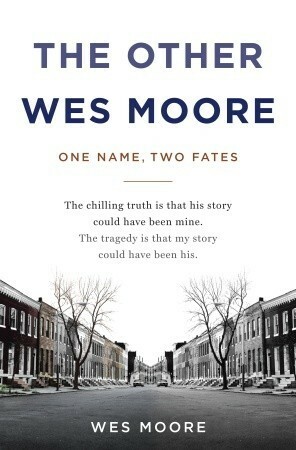 He finally decided to write to the Wes Moore in prison. Over a number of years they exchanged letters, and even visited face-to-face several times. What they discovered was that their stories had many remarkable similarities, beyond their names. Both had grown up without their fathers. Both came from the poverty-stricken neighborhoods of Baltimore, both had run-ins with the police early on. So what led one to change his life completely and the other to land himself in prison? That what this book explores. One of the reasons this book first caught my eye was because my husband has a similar circumstance. There is a man out there somewhere who shares his first and last name, same middle initial, born on the same day, in the same hospital. Unfortunately, this other man is also a criminal, as my husband found out when he failed a routine background check for a job and was nearly arrested. Yeah. So I get it. How could two boys born under similar circumstances end up in such different lives? Moore describes with clarity the desperation of the hood, where working an honest job barely makes enough to feed the kiddos (and keeps you away from home all day and evening), while joining up with a drug crew makes more than enough for needs and wants. Of course, you stand a lot better chance at getting killed or jailed, but the money must be so tempting. He also delves into the difference that strong family connections makes, particularly when trouble comes along. Both boys were headed for trouble, and both got second chances. One quote that stuck with me: "I guess it's hard sometimes to distinguish between second chances and last chances." I have a lived a very sheltered life, with my 2-parent home and my white, middle-class privileges. It was good to read this to catch a glimpse of life from another angle. Moore ends the book with a list of more than 200 organizations that are dedicated to helping underprivileged kids. Content: There's some language, descriptions of drug use and drug dealing, some violence. 4 stars: This gave me deeper insight into the time period, and also into the relationship of Joseph and Emma. I really enjoyed it. This one will probably be of most interest to those who are members of the Church of Jesus Christ of Latter-day Saints--Mormons, like me. :) Written by a great-great-granddaughter of Emma and Joseph, who joined the church as a convert, this book focused on Joseph & Emma's relationship with each other throughout their 17-year marriage, and the way the various events unfolding in the early church affected them and their family. I gained an even greater appreciation for all they went through, and the way they supported each other through all the hardship they faced. There were many things I found fascinating that I haven't seen anywhere else--in particular, both of their Patriarchal Blessings were included. It was eye-opening to understand just how much loss they each suffered, particularly Emma. My heart really goes out to her. It seems that she sometimes is judged rather harshly in the church, because after Joseph's death she did not go west with the Saints, but stayed in Nauvoo. This book just strengthened my feeling of respect and admiration for her. Often with barely enough for themselves, and in times of great personal distress, she would be called upon to feed and house any number of people, which she did willingly and with compassion. She was ever faithful to and a strength to her husband. She mothered many--her own children and others. I also appreciated the author's focus on their family life and marriage. So much is written about that time period in the early Mormon church, but with a few notable exceptions, we don't get the perspective of how all this would have been affecting Emma and Joseph, and their little family. I was wondering how Jones would handle the polygamy issue. She touched on it briefly, but her main focus was on Joseph and Emma. I would have liked to learn a bit more about that, because I know Emma really struggled with it. I read this over several Sundays a bit at a time. 5 stars: Heartfelt and evocative. 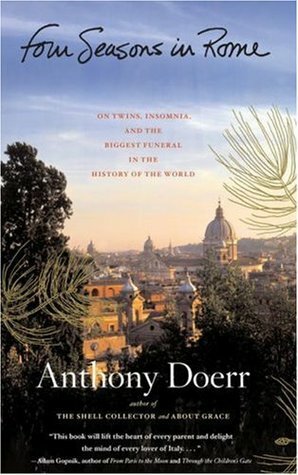 Doerr writes of his writing fellowship in Rome, Italy over the course of a year. He received a letter in the mail informing of the award as his wife was in the hospital, having just given birth to their twins. He describes the endless sleepless nights with two crying babies, the transcendence of light, the wonder of the Pantheon. He also delves into some of the history, and of course, the funeral of Pope John Paul II alluded to in the title. I really enjoyed this. I had the chance to visit Rome several years ago and I loved it. I felt what he felt in the Pantheon, but he found the words to describe it that I never could. Then there's the new parent blur of exhaustion--times two. I've never had twins, but I have been there, too, with a colicky baby that wouldn't sleep unless she was being bounced in our arms. I especially liked what he had to say about removing the mental film that covers our daily experiences, and once again noticing the joy, the awe, and the small moments of wonder that surround us. These two I actually already reviewed on this blog. Click on the titles to see my reviews of The Last Season, by Eric Blehm, or Fearless, also by Eric Blehm. How are you doing on your reading goals, now that we're halfway through the year? These are great reviews. Thank you!